It happens to all of us sooner or later. We prepare well. We practice over and over. But then, something happens that is totally out of our control, and we bomb. So, how do you recover after giving a terrible speech and bombing on stage? Whether the challenge occurs as a result of nervousness or presentation anxiety, or if nuclear reaction came from improper preparation, it happens. Even public speaking pros can bomb a speech every now and then. These are a few things that you can do to recover. Public Speaking Failures (or Perceived Failures) Can be a Learning Experience or a Stumbling Stone. The first thing to remember about having a terrible speech is that public speaking fear comes from situations like this where we have a failure. In fact, you don't necessarily actually have to have a failure on stage to raise your anxiety. Just a perceived failure will trigger nervousness in the future. Anytime we try something new, and we don't perform very well, we will become more nervous when we try to attempt that same skill in the future. Think about it... What would have happened if the first time you ever drove a car, you had a terrible accident. If that drive was your only experience behind the wheel, it will be nerve-racking to get back into the driver's seat. If the first time you ever used a computer, you accidentally erased the hard-drive, you would be very timid about trying again. This is what happens to a lot of people try to develop presentation skills. They give it a try, and then things don't go so well, so they just give up. This happens more in public speaking than it does in other skills because we do it so infrequently. Most of us drive every day. So, if we have an accident, we have hundreds or thousands of past successes to fall back on. So, a single failure doesn't destroy our confidence. However, with public speaking, if we have have a single bad experience, it can often haunt us, because we will likely have fewer past successes to fall back on. The point is that the more successes that you have speaking in front of a group, the less a bad experience will affect you. That is one of the main reasons why people who want to be great presenters often start with a class like Fearless Presentations ®. In a two-day class, a speaker can string a series of eight or more success together. You Performance is Often Not as Bad as You Make It Out to be in Your Head. In our heads, when we don't perform well in front of a group, we think that we absolutely failed. However, in most situations, you probably did a lot better than you think. We tend to exaggerate our failures when we think about them internally. For example, about eight years ago, my company was hired to deliver a huge team building activity for a group of over 800 people. This was the biggest group of people that we had ever organized a team building activity for (at the time), so we were being very careful. Since I had the most speaking experience, I was the main speaker on stage. Just to be safe, though, I brought ten additional professional speakers with me, and we broke the huge banquet hall into 10 sections. Each of these sections had one of the speakers leading a smaller group. We spend two days setting up the room just right. Early in the day, the sound crew came in and did a sound check. Everything was perfect. That is until the first few hundred people arrived. To get a room that would hold the entire group, the event planner rented a huge trade show room that had a hard floor (versus carpeted). As people arrived, the sound created by each person moving echoed off the walls over and over. When people in the group were speaking, their voices added to the noise. The tall ceiling, hard walls, and concrete floor just made the noise echo and echo and echo. As more people arrived, we realized that we had an enormous problem. I was on stage trying to give direction, and no one could hear me. The audio guys cranked up the volume. When they did, I could see the people standing closest to the audio speakers cringing and holding their ears. I also saw the people farthest away from me standing with their palms to the air because they still couldn't hear. Luckily, the 10 facilitators that I brought with me took over. Each of them had their 80 or so person group gather close around them, and they each gave the instructions to their smaller groups. It was embarrassing. The poor event planner was terrified. The sound guys were mortified. When the event was over, though, we got a ton of people coming up to us to tell us how great the activity was. After about the tenth person, the event planner and I were just looking at each other in disbelief. We knew the event was awful. After the 30th person came by and thanked us, though, we began to wonder if we had experienced a totally different event than anyone else did. In reality, though, the first 15 minutes were really frustrating... to everyone. But as the event went on, the participants began having fun, and they quickly forgot about the challenging start. Most people are pretty forgiving. In addition, it was a fantastic learning experience. Because of the challenges on that event, we have been able to alter our delivery in a way that we can conduct our programs for much bigger audiences with just two speakers. That doesn't mean that you shouldn't perform well, but it should give you a little confidence in that we are typically a lot harder on ourselves than the audience is on us. Nine times out of ten, though, most stage bombs start with a person doing things that he or she believe will keep him or her from bombing. For instance, many people will write their presentation out word-for-word and then try to memorize the speech. Although that preparation seems logical, all it takes is one moment during the delivery where you forget what you were going to say, and it will be all uphill from there. 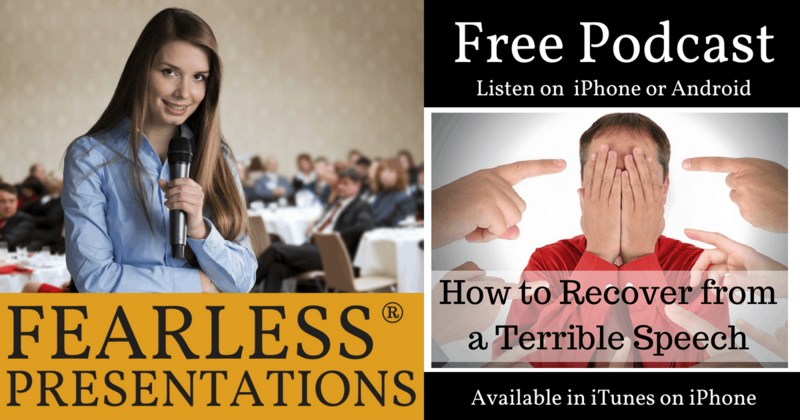 When I created the Fearless Presentations ® class, one of the first things that I designed was a simple way to prepare for a speech without memorizing it. We typically spend a couple of days helping participants master this skill, but in a nutshell, the technique works like this. First, narrow down your topic to something pretty specific. The more that you try to say in one siting, the less likely anyone in the audience will remember it. Once you narrow down your topic, organize your speech into just a few key points. Three, four, or five key points will work well in most situations. I design my presentations by choosing which key points are most important to explaining the topic. Let's say that you have a broad topic, and you have about ten or fifteen things that need to be said about the topic. Chances are that after you cover the first few points, your audience will start to drift off anyway, so instead of covering all ten items, pick the three or four most important items instead. Give a couple of pieces of proof or support for each key point. Add in a story, analogy, a quote, or statistic about the point that you are making. Prove to the audience that what you are saying is true. Two to three instances of proof typically are plenty. If you have three key points and a couple of support for each item, you really only have to memorize about nine things. You could write nine things on one note card and have room to spare. One of the fastest ways to recover from a terrible speech is to get a good coach. I don't mean get someone to critique your performance. A lot of well-intended coworkers or friends tend to do this, and it just makes things worse for the most part. What you want instead is someone who can identify a few of the key strengths that you have as a speaker and who can help you develop those strengths. For instance, where a coworker might tell you that you are monotone, a good coach would help you see that your pretty detail-oriented and have a knack for providing solid support. Since that is a talent, if you stop trying to memorize your speech (see above) you would automatically increase your enthusiasm. Another example would be where a friend might point out that your hands are shaking, a good coach would see that you have a talent for building rapport with your audience (even though you might feel a little shy). If you develop that skill, your nervousness will decrease and your shaky hands will diminish dramatically as well. Focus on the things that you do well versus trying to correct symptoms, and you'll have a lot more success. Bottom-line is that when you have one of those inevitable poor public speaking performances, it's not the end of the world. You can recover from it. If you use it as a learning experience, you'll become a stronger speaker the next time that you give a presentation.